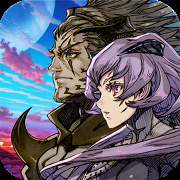 "Terra Battle", mobile RPG, by Mistwalker for iOS & Android. Our story unfolds in a land spiraling toward its own destruction. Of the races that occupy this doomed world, humans are the most prominent. They are joined by both the Lizardfolk and Beastfolk. Each race has its own tongue in which they speak of their mysterious Maker. Neither able to confirm or deny its very existence, the true nature of this Maker remains largely unknown. The combined knowledge of this entity dwells deep within the earth. Beings from across the land gather at the capital to embark on a quest to discover more about their unknown progenitor.